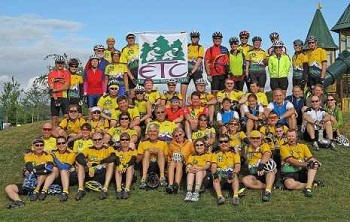 The Evergreen Tandem Club is all about having fun riding together. Through tandem-friendly group rides, workshops and other events we provide opportunities for our members to enjoy tandeming's unique form of cycling. Whether it's through group rides, socializing, skill development or encouragement in reaching fitness goals, we have fun together and enjoy the specialness that is the joy of tandeming. While a few of our biggest events require membership, most of our functions are open to anyone -- even if you ride a "half bike"! That said, we hope you chose to join our club to support the sorts of activities only we provide. Membership is $25 per calendar year (January through December). A membership includes two individuals, although we welcome solo members as well. All that's required is your name and minimal contact information so we can keep in touch. Since much of our communication is online to keep costs low, we just need an email address. THE EVERGREEN TANDEM CLUB DOES NOT MAKE ITS MEMBERS’ PERSONAL INFORMATION AVAILABLE TO OTHERS FOR NON-CLUB PURPOSES AND WILL NOT SELL ITS MEMBERSHIP LIST TO ANY BUSINESSES OR ADVERTISERS.